Thomas B. Coles Jr. (M.D. 1956), M.H.A., was, at age 85, the oldest finisher in the 2016 Detroit International Half-Marathon. Coles has completed 13 marathons, two half-marathons and five bicycle centuries to raise money for the Brain & Behavior Research Foundation. Blair Collier Filler (M.D. 1955), an orthopaedic surgeon, was honored by the Western Orthopaedic Association, which initiated the Blair Filler, M.D., Lifetime Achievement Award. The award was inaugurated during a September 2016 gala in Indian Wells, California, and will be given to individuals who most closely emulate Filler’s efforts to promote service, education and professional relationships. Gordon L. Hyde (M.D. 1957, Residency 1962) received the Rudolph Matas Lifetime Achievement Award from the Southern Association for Vascular Surgery for his contributions to the field of vascular surgery. In 2016, the Gordon L. Hyde Annual Lecture in Vascular Surgery was established at the University of Kentucky, where he spent most of his surgical career. Hyde has helped establish long-term, successful addiction treatment programs in Lexington, Kentucky, and Naples, Florida. Darrell A. Jaques (M.D. 1957), emeritus professor of surgery at the Uniformed Services University of Health Sciences in Bethesda, Md. ; and associate professor emeritus of surgery and of plastic surgery at Johns Hopkins University Hospital, was named an outstanding practitioner during the Greater Baltimore Medical Center’s 50th anniversary. Fredric W. Pullen II (M.D. 1959) was reappointed professor of otolaryngology by the University of Miami Miller School of Medicine. Richard J. Sanders (M.D. 1954, Fellowship 1960), a vascular surgeon, published Thoracic Outlet Syndrome for Patients and Non-Physicians to help patients better understand their condition. Marilyn Jean Bull (M.D. 1968) was recognized by the White House and the U.S. Department of Transportation as a Transportation Champion of Change. Bull is the Morris Green Professor of Pediatrics at the Indiana University School of Medicine. She is renowned for improving transportation safety for children with special health care needs. Dietrich W. Geschke (M.D. 1964), a urologist, wrote 1309 Days to Freedom, an autobiography of his experiences growing up in East Prussia during World War II. Andrew Saxe (M.D. 1969, Residency 1975) retired as professor of surgery from Michigan State University in 2016. MSU’s Department of Surgery honored him with the Andrew Warren Saxe Invited Lectureship in Endocrine and Oncology Surgery. Marshall Strome (M.D. 1964, Residency 1970), CEO and founder of Aero- Di-Namics, and professor and chairman emeritus of the Cleveland Clinic Head and Neck Institute, gave the 2016 Duane A. Sewell Memorial Lecture, titled “Is the Hippocratic Oath Relevant Today?” Strome also will present at the ENT World Congress in summer 2017. Moritz Matthew Ziegler (M.D. 1968) received the William E. Ladd Medal at the October 2016 American Academy of Pediatrics (AAP) meeting in San Francisco. This is the highest award granted by the Surgical Section of the AAP. David H. Anderson, M.D. (Residency 1973), was named Sonoma County’s 2015 Physician of the Year for compelling the city of Healdsburg, California, to raise the purchase age of tobacco products to 21. Ronald B. Irwin (M.D. 1971), an orthopaedic surgeon, published a memoir titled Imperfect: A Cancer Surgeon’s Journey in 2016. Daniel Frank Iyama Kurtycz (M.D. 1976), medical director of the Wisconsin State Lab of Hygiene, and professor of pathology and of laboratory medicine at the University of Wisconsin-Madison, co-edited The Paris System for Reporting Urinary Cytology. Robert W. Rebar (M.D. 1972), professor and chair of the Department of Obstetrics and Gynecology at the Western Michigan University Homer Stryker M.D. School of Medicine, received the 2016 Beacon Award at the 19th Annual Symposium of the Frontiers in Reproduction Research Program. 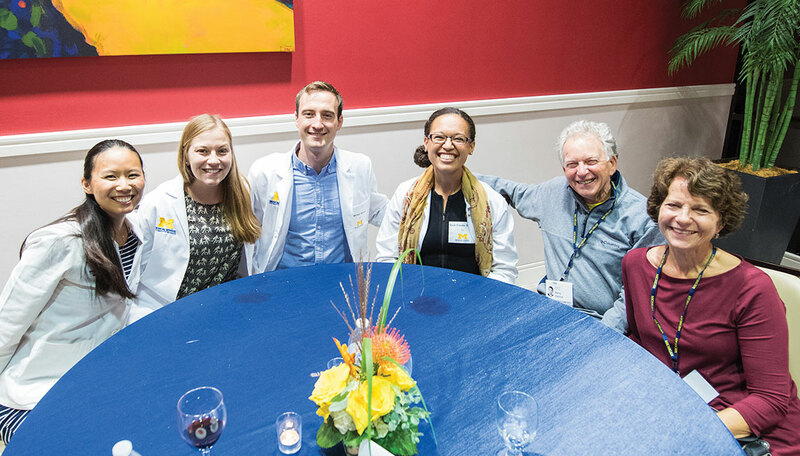 Additionally, Rebar presented the first John Randolph Lecture at the 2016 annual meeting of U-M’s Norman F. Miller Gynecologic Alumni Society. Timothy Kuzel (M.D. 1986), an oncologist and hematologist, was appointed chairman of the Department of Oncology at Rush Hospital and Medical School in Chicago. Hilary McClafferty (M.D. 1986) wrote Integrative Pediatrics: Art, Science, and Clinical Application. McClafferty is an associate professor of medicine at the University of Arizona, Tucson, where she is also director of the Pediatric Integrative Medicine in Residency Program and co-director of the Fellowship in Integrative Medicine. She is a founding member of the American Board of Integrative Medicine. David Jeffrey Mohr (M.D. 1986), clinical assistant professor of family medicine at Louisiana State University and instructor at the Rural Family Medicine Residency Program in Bogalusa, Louisiana, co-wrote a chapter on autism spectrum disorders in the Textbook of Family Medicine: Principles and Practice, Seventh Edition. Sriram S. Narsipur (M.D. 1988) was promoted to professor of medicine, pediatrics and surgery in the Division of Nephrology and appointed interim chair of the Department of Medicine at SUNY Upstate Medical University in Syracuse, New York. Lawrence Allen Schneider (M.D. 1982, Residency 1987), an orthopaedic surgeon, received an award for one of the 11 best sports medicine technologies of 2016 from Orthopedics This Week for his invention, the Procellera Antimicrobial Wound Dressing with Advanced Microcurrent Technology. Elyse Feldman Weinstein (M.D. 1986), a psychiatrist, was appointed M.D. director of physician recruitment for the Kaiser Permanente Medical Group in Northern California, the largest medical group in the country. Sandra Lynn Freiwald (M.D. 1993), assistant chief of general surgery at Kaiser Permanente San Diego; subsection head of the general surgery department; and chairperson-elect of the Department of Surgery at Palomar Medical School, received the 2016 American College of Surgeons/Pfizer Domestic Surgical Volunteerism Award for bringing medical and surgical care to uninsured populations via Project Access San Diego. Bertrand Liang, M.D. (Residency 1992, Fellowship 1993), Ph.D., MBA, a neurologist, published The Pragmatic MBA for Scientific and Technical Executives and Managing and Leading for Science Professionals. Andrew V. Pasternak IV (M.D. 1993) was inaugurated as the 2017 president of the Washoe County Medical Society board of directors. He is the founder of and practices at the Silver Sage Center for Family Medicine and Silver Sage Sports and Fitness in Reno, Nevada. Page Pennell, M.D. (Residency 1993), was elected second vice president of the American Epilepsy Society. Pennell is professor of neurology at Harvard Medical School and director of research for the Division of Epilepsy at Brigham and Women’s Hospital, with a secondary appointment in the Division of Women’s Health. Justin Clark (M.D. 2007), a neurosurgeon, received the Grand Rapids Business Journal 40 Under 40 award. Salvatore J. Pacella, M.D. (Residency 2007), MBA, recently co-authored Aesthetic Facial Reconstruction After Mohs Surgery, which includes chapters written by Michigan Medicine faculty. Pacella is the division head of plastic surgery at Scripps Health in San Diego and La Jolla, California. Shaun P. Patel (M.D. 2012), chief resident of orthopaedic surgery at Harvard University, was included in Forbes’ 30 Under 30 list for his app OrthoNinja, which streamlines consults between doctors. Clayton Pratt (M.D. 2017) wrote The Touring Tandem, which details his experience tandem cycling 10,000 kilometers across Europe and Asia with his wife between his pre-clinical and clinical years of medical school. Michael Roh (M.D. and Ph.D. 2005) joined the faculty in the Department of Laboratory Medicine and Pathology at the Mayo Clinic in Rochester, Minnesota. James B. Yu (M.D. 2004), associate professor of therapeutic radiology and director of the Prostate and Genitourinary Cancer Radiotherapy Program at the Yale School of Medicine, co-edited the Pocket Guide to Radiation Oncology.